Another great conference I attended in July was my first virtual one–Reform Symposium 3 (RSCON3). Shelly Terrell, who I just met at ISTE and have been twitter-stalking (not to be confused with real stalking, LOL) over the past year, is a lead organizer of this amazing conference that draws thousands of educators from around the world to attend three days of concurrent sessions and keynotes, all online. Even the schedule for the conference was mind-blowing with sessions starting as early as 3AM and going all the way to 10:00PM. Honestly, I knew nothing about RSCON3 until about a week before when Shelly sent out a tweet looking for volunteers to moderate sessions for the conference. Although I knew very little about what it entailed, after looking at the RSCON3 website, I decided that was too big to miss, and that I would figure things out as I went along. After signing up to moderate, I was given a link to the organizers’ schedule where I could fill my name in to moderate sessions I chose. I ended up signing up to moderate about 7 or 8 sessions, because so many interested me! I also noticed that there were still a few blanks for presenters, so I tweeted Shelly to see if it was too late to present. Although I had only an hour to decide what I was presenting about, Shelly fit me in and I’m soooooo happy she did! A few days later, I was featured on the front page of the RSCON3 website much to my (and my friends!) surprise, and my excitement was building for this event. I even created my first ever “trailer” video for my presentation to post on YouTube and my presentation webpage. I also moderated for a diverse group of educators, consultants, and administrators, learning about how education looks in different parts of the world. I moderated sessions on everything from building a Twitter PLN to doing away with letter grades in the classroom. I was also very impressed by the keynotes–my favorite was by a principal in Philadelphia, Salome Thomas-EL (@Principal_EL) who was soooo inspiring. Words cannot capture how great his talk was, so here’s a link so you can see it for yourself–I will embed the YouTube video as soon as it’s available. Another intriguing aspect of RSCON3 was the number of educators who presented on very non-traditional methods of teaching that are gaining traction here in the U.S. No grades or curricula, just kids following their passions and learning a lot along the way. I will definitely begin to incorporate these methods in my courses in this coming year. If you missed RSCON3, don’t worry, all the sessions were recorded! Check out this link to watch any session you want to see. I thoroughly enjoyed every minute of RSCON3! I totally blew my diet (and gained several pounds :S) sitting in front of the computer for 3 days straight, but it was worth it, as this was the most enriching experience of my professional life, hands-down. In my pajamas, (or sometimes underwear, LOL) I connected with a group of educators from all around the world who shared my passion for teaching and learning. I walked away (or should I say “logged off”?) with a ton of new ideas and a true excitement for the coming school year. The best part is that I don’t even have to wait a whole year to do it again. Although this is the third symposium, it only started last year, as there is one in the summer and a one-day RSCON for new teachers in January. This time I plan to get involved early so I don’t miss a thing! Take a “bite” out of writing! Today, I conducted a PD with my co-workers about writing. I reminded them about using the “hamburger paragraph” (top bun=topic sentence, meat/lettuce/tomatoes=3 supporting details, bottom bun=conclusion sentence which “holds it all together”) as a way to help students structure their writing appropriately. 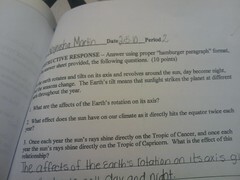 Above, you see an example of how a teacher used the hamburger paragraph to help her students write short answers on a test. 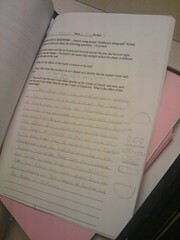 One student even drew a hamburger in the margin to help her remember how to write her answer! Visit bakerella to get the details on how to make these cute cupcakes! 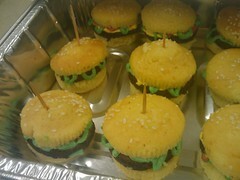 (Yes, they are CUPCAKES.) Thank you, Robyn, David, Rinieca, Terralyn, Ashley, Shane, and Ahmad for your help! You did a great job! For more info on writing the hamburger paragraphs, visit this page for a printable handout for your students and go here (at the bottom) for lots more. 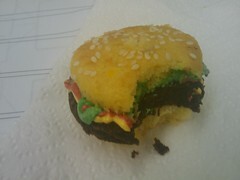 Posted on March 9, 2010 Categories personal updatesTags English, hamburger paragraph, outline, professional development, writingLeave a comment on Take a “bite” out of writing!